A custom painted piece of furniture, made to the customers specific requirements. A piece for the corner of the office, cage tucked away securely and safely and storage space too. We have been creating beautiful hand crafted pieces of furniture for all types of pets throughout North Devon and beyond. We produce bespoke wooden pet furniture that is built to last, offering years of functionality and comfort using only quality timber, fittings and finishes. The possibilities are endless, we can produce the item that you need, to your specifications to fit into your room, or your available space. Get the perfect dog, cat or even Guinea Pig bed, made to fit beautifully for any room in your house or office. We of course can apply our colour matching service to all our pieces. Full assembled - handmade, direct from the manufacturer. 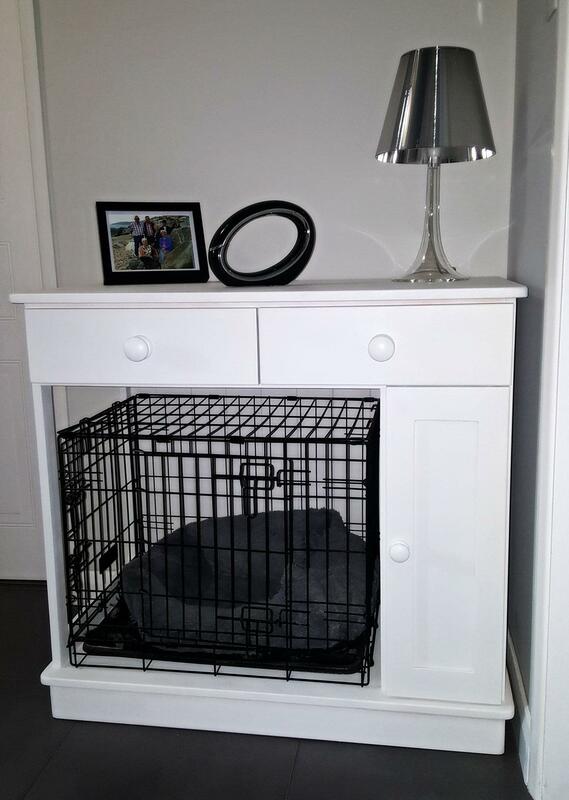 Our wooden dog crate furniture is handcrafted, doubles as a safe haven for your pet and offers a decorative and functional piece of furniture for your room. Optional removeable dividers, hidden litter trays, wipe-clean painted finishes.